x64dbg is a new Windows debugger entirely free and open-source. The project is hosted on GitHub : https://github.com/x64dbg/x64dbg. I learnt about x64dbg thanks to the Nuit du Hack 2k16 convention where the developer and founder, Duncan OGILVIE (@mrexodia) gave a talk about it. You can find the slides and a video of his presentation on this page : https://github.com/x64dbg/x64dbg/wiki/Contributing. The project was started in 2013 and has been under active development ever since. I decided to give x64dbg a shot, and I'm loving it. The interface is very intuitive, clear and customizable. There is a plugin support system with already a dozen of interesting plugins, ScyllaHide being one of them. There is also a lot of very useful commands that you can quickly type in the command line at the bottom. You can download the latest build here : https://sourceforge.net/projects/x64dbg/files/snapshots/. It contains both x64dbg and x32dbg. 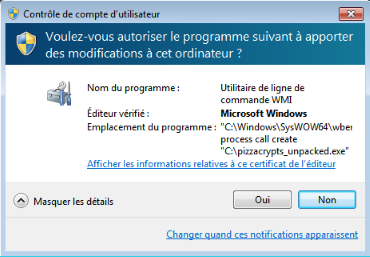 Pizzacrypts is another recent ransomware installed via a RunPE dropper. Since we're seeing more and more of those, it is always interesting to do some reversing and see how it works. If we put a breakpoint on the first WriteProcessMemory(), we can get the content of the lpBuffer parameter to find where the payload is being copied from in memory. The method we used will work with most RunPE droppers. Pizzacrypts isn't really worth a thorough analysis, I'll only talk about a few interesting things. But will only check for vboxhook.dll and vboxmrxnp.dll, try to load them and call ExitProcess() if the loading was successful. 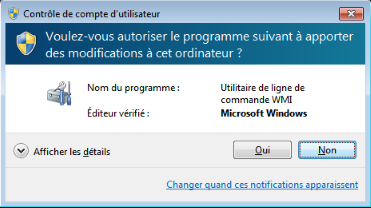 line = str_clear + "\"\n"
"C:\Windows\SysWOW64\wberm\WMIC.exe" process call create "C:\pizzacrypts_unpacked.exe"
This command is used to trigger the UAC via WMIC.exe, which is a Microsoft Windows file, to make it look like a trusted Windows program is trying to gain admin rights. Rest is standard ransomware stuff.